Soak a hand towel in fabric softener. Squeeze out any remaining drops from the towel. Hang it over a towel bar (or outside on a clothes line) to dry. Your house will smell clean for the three days while this towel is completely drying. 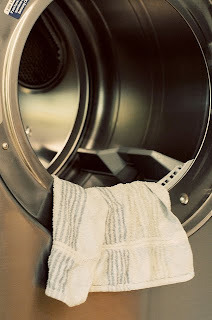 After the towel dries, you toss it in your dryer along with clothes - using it as a dryer sheet for 40-50 loads before soaking again. Check Amazon for natural fabric softener ideas! -- Have you ever made your own household cleaners? I remember making a drain cleaner that worked perfectly! For just pennies you can have a disinfectant spray cleaner that is not only green, but frugal as well. Rather than buying a commercial disinfectant cleaner, you can make one at home. 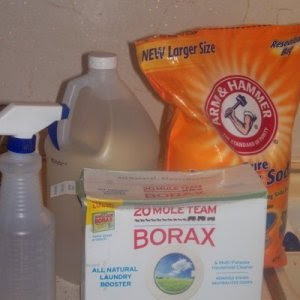 This is a guide about homemade disinfectant cleaners. All you need is borax, vinegar and baking soda. Check Amazon for more homemade cleaner ideas! 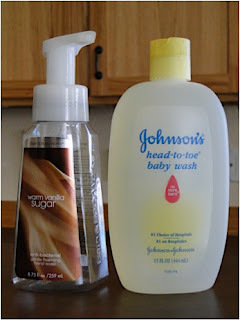 -- Such a simple way to save $$ and stretch your dollars on baby wash - or any other body wash! I imagine you could do this with most body washes. Anyone done this? How did it work out? If you try this, let us know if it is successful for you! Check Amazon for more homemade foaming baby wash ideas!